NEVER TRY TO SAVE RECOVERED FILES/​FOLDERS TO THE SAME LOGICAL DISK WHERE THEY RESIDE!!! See the Data Recovery Issues topic for details. Basic file recovery can be made for deleted files that has resided on an existing logical disk visible to the operating system. In all other cases, Advanced Data Recovery is required. • Select the disk and press the F5 key. If you try to enumerate files on a hard drive or another object without a valid file system on it, a Double-click a logical disk... message will appear. Select a logical disk on the object or scan the object. R‑Studio analyzes data on the object and displays all files for which records have been found in the analyzed tables. If files have not been found, that means that their records have been deleted. To find such files, Advanced Data Recovery is required. Please note that R‑Studio shows only those files/​folders that match a specified file mask . You may also arrange the data as required. On the View menu, select Arrange and them a required arrangement. You may specify which columns will be visible on the Files panel. On the View menu, select Contents Columns , and select the columns you want to see. Files can be shown as a list or as icons/​tiles of different sizes. R‑Studio shows its estimates of chances for successful file recovery in the Rec column. You may view some information about a file. Right-click the file and select Get Info on the context menu. 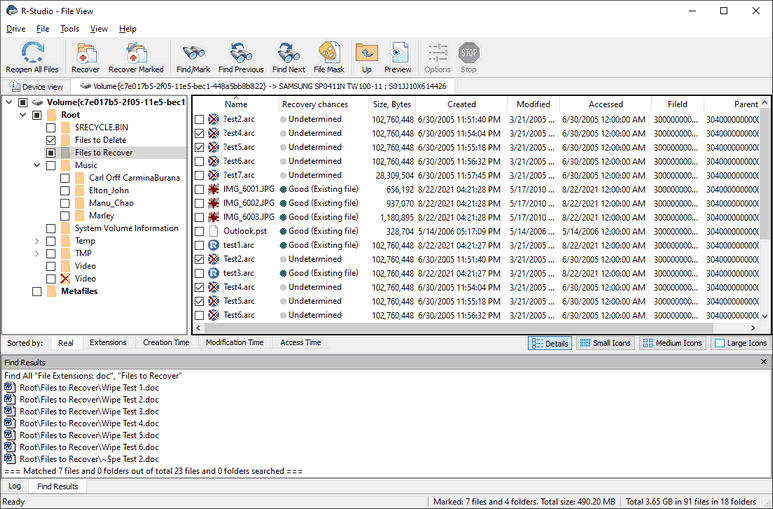 R‑Studio Technician shows much more information about a file. See the Information about a File topic for more details. The Log panel will show how many files and folders are on the object, and their size. You may specify which events will be shown in the log pane by setting a log filter . Note: Metafiles are the file system's internal files invisible to any user, or file system data, which R‑Studio represents as files. These files do not contain user data directly. Unless you want to scrutinize a disk file system, do not restore them. If the Too many files... message appears, you may temporally stop file listing and browse through found files. Then you can resume file listing. You also may skip this file topic and continue. R‑Studio will keep information about the entire file structure. You may also copy the information about folders and files. To copy the file path. To copy all the columns of the selected file. You may select several files/​folders in the same parent folder by pressing the Shift button and clicking the objects simultaneously. Mark a file/folder to recover by clicking the box left to the object, or select Mark on the shortcut menu. You may mark several files/folders in different parent folders. You may mark all objects in the folder by selecting Mark All on the Tools or shortcut menu. To unmark an object, click the box left to the object once more or select Unmark on the shortcut menu. You may unmark all objects in the folder by selecting Unmark All on the Tools or shortcut menu. The Log panel will show how many files and folders you have marked, and their total size. R‑Studio can search for a particular file. Go to the Searching for a File topic for details. If you need to find and mark many files, go to the Find and Mark Multiple Files topic for details. File content may be previewed before recovery. Go to the Previewing Files topic for details. If you still cannot find files that you want to recover but are sure they have existed on the logical disk, you need to use Advanced Data Recovery to find them. • Press the F2 button. If you have another computer connected to R‑Studio over network, the Recover dialog box will be slightly different. See Data recovery over network for details. If this check box is selected, R‑Studio recovers the entire path to the selected object. If this check box is selected, R‑Studio recovers the entire path to the selected object starting from the root folder of the disk. If this check box is selected, R‑Studio recovers disk metafiles. Metafiles are the file system's internal files invisible to any user, or file system data, which R‑Studio represents as files. These files do not contain user data directly. Unless you want to scrutinize a disk file system, do not restore them. If this check box is selected, R‑Studio recovers alternative data streams for file systems that support them. Has no effect on FAT files. See Extended Information Recovery for the NTFS file system, and Data Recovery on HFS/​HFS+ File System for the Mac computers. If this check box is selected, R‑Studio recovers security attributes for NTFS files. Has no effect on FAT files. See Extended Information Recovery for details. If this check box is selected, R‑Studio recovers extended (HPFS) file attributes. Enabled when the files are sorted by their extensions or date. See Find and Mark Multiple Files for details. If this check box is selected, R‑Studio recovers the real folders/​files structure on the disk rather than that of sorted files. 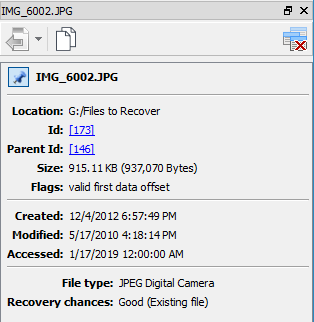 If this check box is selected, R‑Studio skips files with bad sectors and displays their list on the Files with bad sectors dialog box when the recovery has been completed. You may separately decide later what to do with those files. See Bad sectors for details. 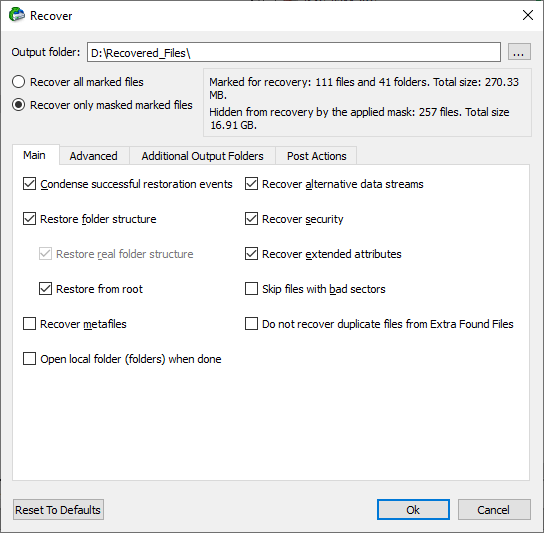 If this check box is cleared, R‑Studio tries to read those sectors several times (specified on the Settings/​Bad Sectors dialog box), and, if fails, fills bad sectors in the recovered file with the pattern specified on the same box. Information about such files will appear in the Log . If this check box is selected, R‑Studio does not recover files from Extra Found Files (raw files) that coincide with files recovered from the file system. If this check box is selected, R‑Studio recovers all content of a selected folder, ignoring a specified File Mask . If a file to be recovered appears to have an invalid name, a Broken File Name dialog box will appear. You may correct the name and resume file recovery. Shows the current incorrect file name. Field for a new file name. Click to resume file recovery. All other files will be renamed according to the specified rule. If there is no space available for the recovered files, the There is not enough space on the disk dialog box will appear. You may either select other place to store the files, skip that particular file or abort the recovery process. The Recovery progress indicator will show the log and progress of recovery process. Note: R‑Studio recovers files from Ext2/3/4FS partitions, but writes it to FAT or NTFS local disks. Or you may write such files to network disks. R‑Studio successfully recovers files from Ext2/3/4FS partitions except its security attributes. R‑Studio recovers symlinks as files containing the path to files which symlinks point to.